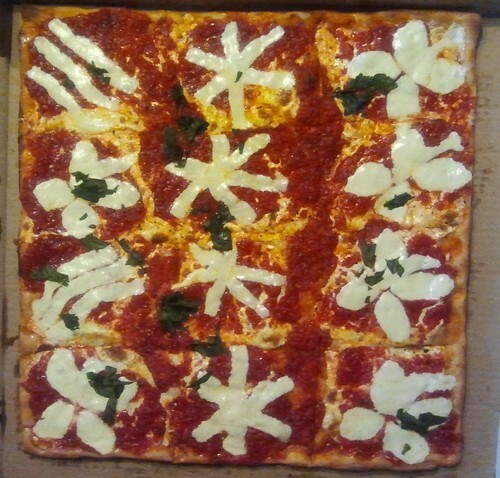 Not too long ago, Maryanne read about a new pizzeria opening in East Hartford, called Villa Milano Famous NY Pizza. According to the article in the Hartford Courant, owners Eddie and John Kilenovic owned pizzerias in NYC and recently decided to move their businesses to Connecticut. Over the past couple of days, we stopped in a few times to try out the various pizzas and other items. Villa Milano is located at 456 Main Street in East Hartford. It's on the north-bound side of the street right across from the Coca-Cola Bottling Company's deco brick building. Keep a sharp eye out as you approach, because the unassuming brick building can be kind of easy to miss. The pizzeria offers both take-out and dine-in service. As you walk in the front door, there are a series of booths on the right, and a glass display case and service counter in front of the kitchen on the left. The display case usually shows off several of the delicious foods on offer - there are garlic knots and pizzas ready to sell by the slice. Look at that. That's not just a pizza, it's a work of art. And it was also one of the best Sicilian pies we have ever had. The dough was just slightly crispy at the edges and on the bottom, but light and pillowy beneath the excellent sauce. Shredded mozzarella was sprinkled atop the sauce, and then the pieces of fresh mozzarella were added in decorative designs of stars, flowers, and stripes. Fresh basil leaves were sprinkled over the pie after it came from the oven, allowing the residual heat to wilt them into sauce and cheese. It was an awesome Sicilian pie, one like I haven't had in over twenty years, and this pizza resolved us to return to try out some of the other offerings. 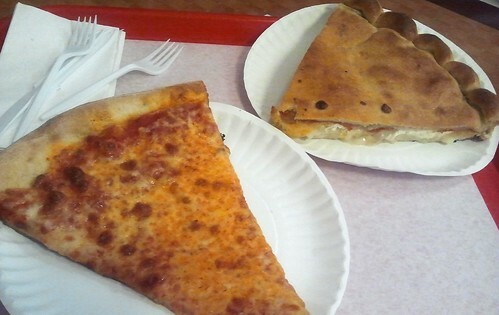 On a later visit, Maryanne and I decided to sample slices of their standard thin-crust New York-style pizza, and the Roman Pie. The Roman Pie, top right in the picture here, is a stuffed-crust pizza filled with potatoes, sausage, pepperoni, and cheese. I'd never had anything like it - it was very good, and quickly became one of Lynnafred's favorites. The New York pizza was absolutely perfect - a hand-stretched water crust, perfectly crisped on the bottom with just the right amount of char, and yet maintaining the ideal amount of chewiness and tenderness combined. Take a peek at the picture on the right. That's the color of a pizza crust the way it is meant to be. Just awesome. 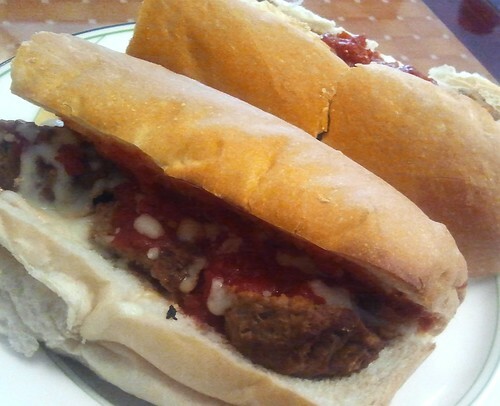 We also ordered a meatball grinder and kept it simple with sauce, meatballs, and cheese on a 12-inch roll. It came out of the oven nicely toasted, crammed with eight huge handmade meatballs and dressed with tomato sauce and melted cheese. Maryanne and I cut it in half to share because it was more than enough for the both of us. The meatballs were very much like the ones my Italian grandmother used to make, though she used to put Romano cheese in hers and Villa Milano doesn't. The texture was very good, and I wouldn't be surprised if they made their meatballs with a pork and beef blend. One other thing: No trip to Villa Milano would be complete without an order of their garlic knots. They are absolutely stunning - little knots of the tenderest yeasty dough, baked up golden brown and delicious with melted butter and garlic. There are six knots in an order for two bucks. After our first time there, we've always made sure to get a double order to go. Most of them make it all the way home. The ones that don't get eaten right away reheat nicely in the toaster oven for a garlicy morning breakfast treat. So: Villa Milano. Great place for authentic New York pizza without driving to New York. 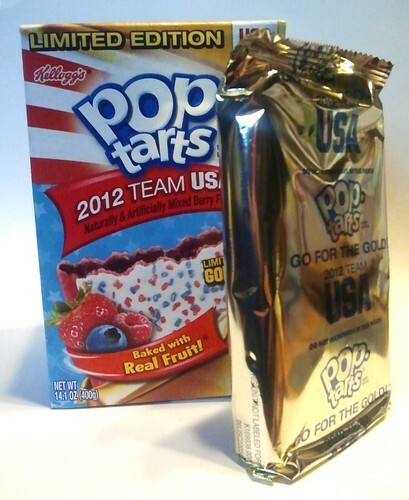 What could be more American than Pop Tarts TEAM USA Mixed Berry flavored Pop Tarts with special, Limited-Edition GO FOR THE GOLD foil packaging? How patriotic! Pop-Tarts that are baked with Real Fruit (follow the front-label apostrophe to the bottom of the side panel where, in small print, you'll find that Real Fruit! actually means "equal to 10% fruit") and covered with red, white, and blue frosting & sprinkles. I bet if the Olympics featured a Snacking event, America would sweep the medals. There are some guys I know who use steak sauce on every bit of meat on their plates. They could be eating the most perfectly-cooked, delicately seasoned prime porterhouse steak, and they'll slather their sauce of choice on every bite. That's not me. I enjoy steak sauce now and then. Used sparingly, it can add some flavor and moisture to meat that's been overcooked. And of course, there are good sauces and bad - and if a steak sauce is bad enough, I'd rather eat the toughest most gnarly cut of mammal totally dry rather than ruin it even further with awful steak sauce. I'm not sure why I've never reviewed steak sauce before. I must have sampled dozens of them over the years. But that's about to change as I review a specialty steak sauce that might not be widely available outside of New England: Chubby's Bourbon Steak Sauce, which is made in Greenfield MA - a town about half an hour or so north of me. I like the flavor of bourbon, and I've had other bourbonized steak sauces, so I was prepared to like Chubby's. Unfortunately, while I can honestly say that it is not too bad a sauce, I can't really recommend it as anything but a novelty. It's not the breath-catching alcohol vapors that do it: it's the readily-apparent cheapness of the bourbon. I'm not saying that Chubby's should be using Maker's Mark in their sauce, mind you, but it kind of tastes like they're using a blend of hair tonic and rubbing alcohol in the blend. Up in Maine, there's a chain of job lot stores called Marden's. They are old-school job lotters, buying up stray pallets of merchandise, bankruptcies, close-outs, salvage lots, and so on. That's what makes them so awesome - they approach the odd lot market the way these kinds of stores did fifty years ago, so they manage not to have the same old manufactured-for-the-dollar-market stuff that everyone else has. No, Marden's carries the true odd lot stuff that only comes from purchasing a boxcar full of merchandise originally destined for a bankrupt department store. I love the place, and I never go to Maine without making it a point to spend some time rummaging through the shelves at whatever Marden's is closest to my destination. By now, you're wondering what any of this has to do with a blog post that is supposed to be a review of Jack Link Teriyaki Beef Steak. 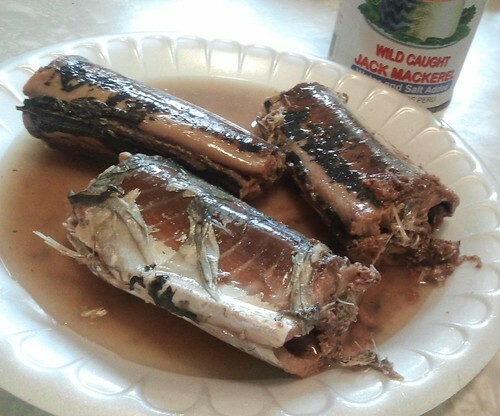 Well, I was up on the south coast of Maine last Friday, and the Marden's in Biddeford had these Jack Link Teriyaki Beef Steaks on sale, two for a dollar. So I sprung for a couple of Beef Steaks. As much as I love beef jerky, these "steak" things are never as good as jerky, and I knew this experiment was not going to end well. I knew I was in trouble as soon as I unwrapped it and found that the only way to really tell where the plastic coating ended and the Beef Steak began was by the lurid red color of the...um, what should I call this stuff? Meat? 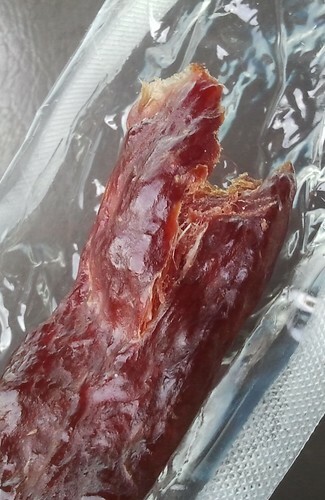 Got to admit, it wasn't a nasty tube of grease the way some cheap meat meat snacks are. It smelled like pretty authentic teriyaki beef. It even kind of tasted like authentic teriyaki beef. But the texture totally lost me. It was amazingly like a Twizzler, except salty and loaded with uneven lumps of what Jack Link assures me originated somewhere on the body of a cow. It was a cheap snack and luckily we were on our way to Portland when we stopped, so I was able to wash the cheap teriyaki flavor out of my mouth with a dozen oysters and an IPA at J's. 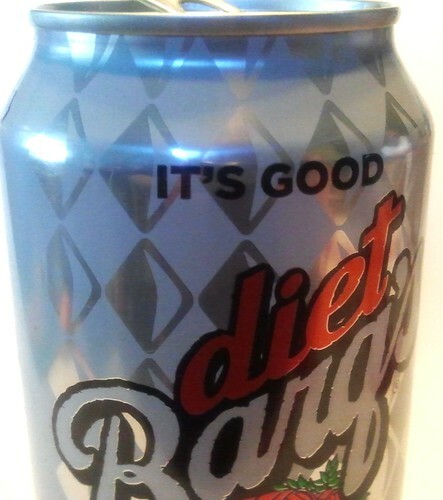 I picked up a 24-pack of Diet Barq's root beer the other day, and the first thing I noticed was the slogan above the logo: "It's Good." Now, it may have been a while ago, but the last time I had bought Barq's, the tagline was "Barq's Has Bite!" which was a reference both to it's snappier flavor compared with other commercial root beers and it's caffeine content (not many root beers are caffeinated.) Long-time drinkers of Barq's have noticed that the flavor hasn't been quite the same since Coca-Cola acquired the brand and started tweaking the recipe (some people have complained that the "bite" seems to be a thing of the past) so I got all set to write a sarcastic blog post about Barq's lazy marketing department not being able to think of anything more clever to put on the label but "It's Good." I always try to do at least a little research about things I'm going to write about so I don't come across as being completely stupid, and when I started to dig into Barq's long history I found out that the company was founded as Barq Brothers Bottling Company in 1890, started selling Barq's in 1898, and their original slogan was simply, "Drink Barq's. It's Good." Well shut my mouth wide open. The best I could do with that info was make a lame joke about how they dropped half their original slogan because people nowadays have half the attention span they used to. It was a beautiful day on Sunday - sunny and warm, but with low humidity - and we decided sort of on the spur of the moment to go berry picking. We were hoping for raspberries, even though the season is just about over. 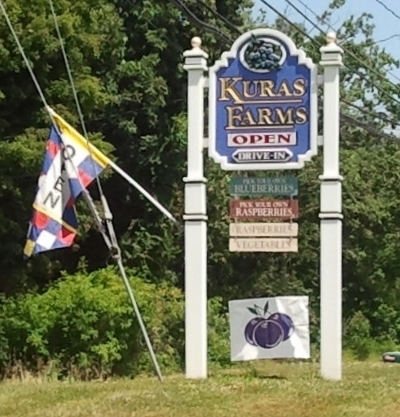 As we drove through nearby Suffield, we lucked out: Kuras Farms on Mountain Road was advertising raspberries and blueberries, ready-to-go or pick-your-own. At many of the local farms and farm stands, the raspberry season has already ended. Last year's unusually warm winter gave perennials like berries an early start, and the recent hot and rainless weeks have not been kind to growers. We pulled in the gravel driveway and stopped at the sales shed and were told that the blueberries were in full swing, and there were still some raspberries available in fields near the top of the hill behind the barns. Off we went, following the farm's dirt tote road on it's winding path to the berry fields. 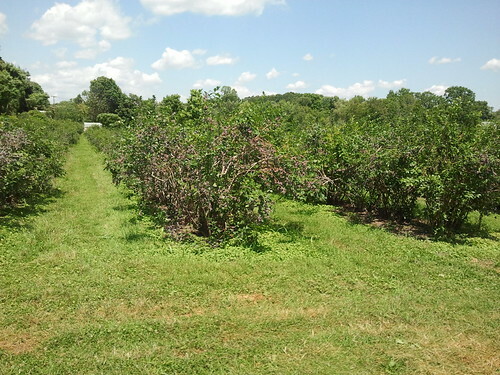 Blueberry season is in full swing, and we passed row upon row of highbush blueberry plants heavy with fruit. But since we were totally focused on raspberries, we decided to return later in the week for blueberry picking. The path turns steep as the road climbs the hill to the raspberry fields. I was grateful for the traction of our SUV though the roadway was well-packed and dry, so we never needed 4 wheel drive. The road does get rough in a couple places, though, so be careful if you come in a low-slung car - keep your speed low and watch for ruts carefully. We parked on a level, grassy spot and started the short hike to the raspberry rows. On the way I noticed a single row of blackberries to the left, and headed over to gather a basket of them while Lynnafred and Maryanne went for the raspberries. 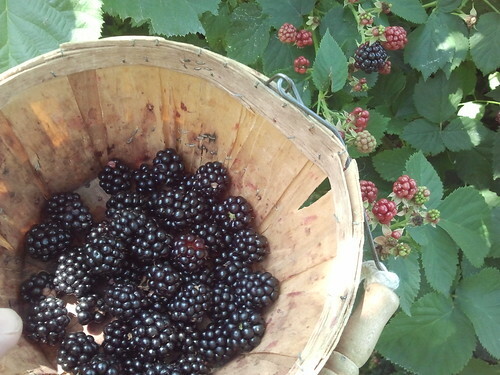 It didn't take us long to fill three two-quart baskets with berries. 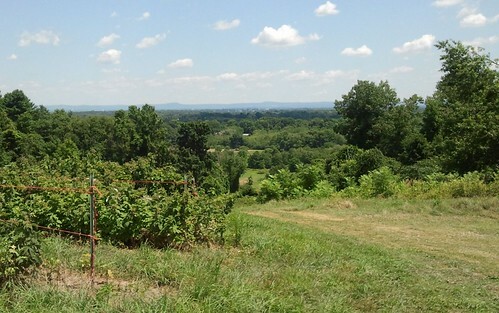 The view east across the Connecticut River Valley from the raspberry fields was breathtaking on such a clear day. Driving the road to the fields is a delight to the eye, and the farm is truly a local treasure. There are meadows with wildflowers, ponds, and fields of crops. Barn swallows flit along the grassy fields and dip into the ponds as they zip by. 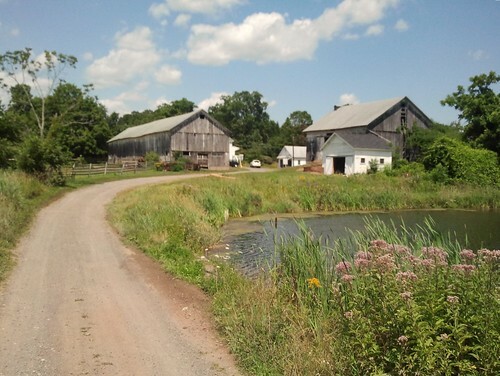 We felt somewhat honored that the farms owners choose to share their beautiful landscape with us by opening up the farm for pick-your-own enthusiasts, rather than just offer a roadside farmstand. The kids working the picking and sales shacks are friendly and helpful. Visiting here is just a wonderful experience. Raspberry season is just about over, so if you plan to go you should do it very soon. It looks like the blueberries will be there for a little while yet. 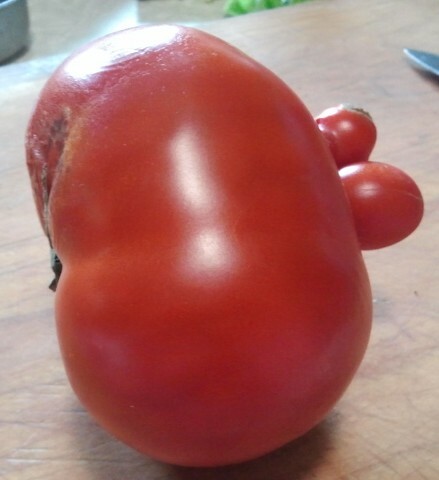 The Kurases also sell vegetables grown there. I enjoy a good barbecue sauce. 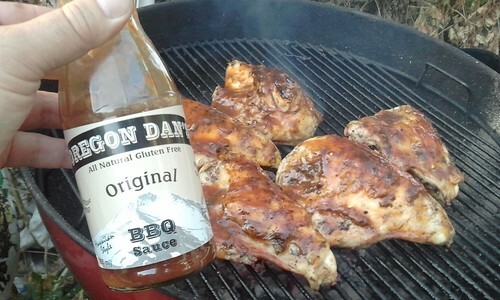 There's nothing like chicken or pork, cooked slowly over coals and finished off with a tasty, tangy sauce. I'm picky about the sauces I buy. For one thing, I won't even consider a sauce if it's made with high fructose corn syrup. 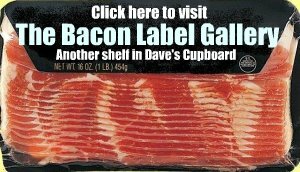 Read the labels sometimes - you won't believe how many BBQ sauces have HFCS as their first ingredient (which means that they're often little more than tomato-flavored corn syrup.) And I'm not really interested in sauces that are basically ketchup, worcestershire sauce and brown sugar. I can make a better sauce than that at home - I want something interesting and, hopefully, unusual. And finally, I tend to pass up sauces that have "smoke flavoring" added. I'm cooking over wood already. 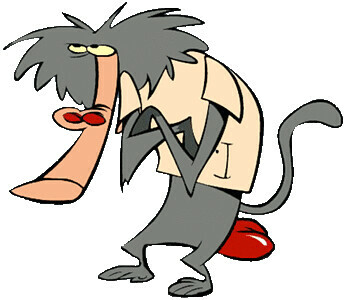 I'll put my own smoke flavoring in, with real smoke. Anyway, I don't remember where I was when I found Oregon Dan's Original Hawaiian Style BBQ Sauce, but when I read the label it seemed like something I might like. Real sugar, tomato sauce, pineapple juice, some vinegar, some spices...it just sounded good. Unfortunately, it really didn't live up to its promise. For one thing, it was as sweet as candy, and the tang of the vinegar didn't do much to moderate that. Since Oregon Dan is adding pineapple juice to the sauce, he maybe should have cut down on the sugar a little and let the pineapple do the work. On top of that, the sauce was thin, almost watery. When I make barbecued chicken (as shown above) I pile the coals in the center of the grill and arrange the chicken in a ring around it. It lets the coals perform their magic slowly even with the higher heat, and the chicken just takes its own sweet time cooking, slowly building up a delicious smokey flavor and crisp-but-not-charred skin. Then, just before the meat is fully cooked, I dress the pieces with barbecue sauce and begin turning them and basting them, letting the sauce thicken and caramelize as it faces the fire. The result is usually perfect barbecued chicken. But Oregon Dan's sauce was so runny that it drooled right off the chicken as soon as I could apply it. It splattered wetly onto the coals below and started putting them out. I was very disappointed. If I ever find Oregon Dan's sauce again, I won't be buying the Hawaiian Style. Maybe there are other flavors that are better balanced. Or thicker. This variety is off my list. Wow, what could be more convenient than a little carton of dehydrated tater pellets that can magically turn into a whole pound of hashbrowns? And look! The front label says it "grills in under 5 minutes!" Fill carton to FILL LINE with hottest tap water. PAN FRY on one side 3-4 minutes, or until golden brown. Refrigerate leftovers. So they might "grill in under 5 minutes" but the preparation time is a lot longer than that. 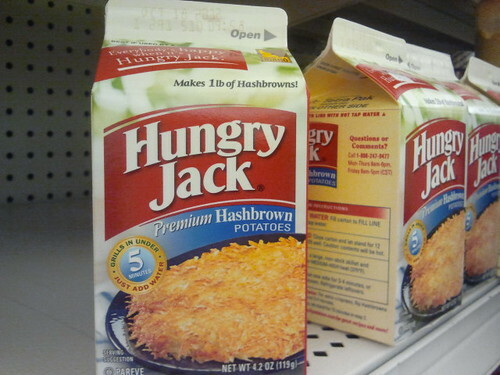 And when you're done with your 15 minutes of cooking (almost 20 if you decide to flip the hashbrowns over and, you know, cook the side that Hungry Jack seems to have forgotten about in Steps 1 through 4) what have you got? Fried rehydrated tater pellets. Seems to me that I can shred a pound of potatoes using an old-fashioned box grater and fry up some real hashbrowns in about the same amount of time (even less if I use a food processor to do the cutting.) And they won't taste like cardboard. I never know what I'm going to find when I go into a Dollar Tree. 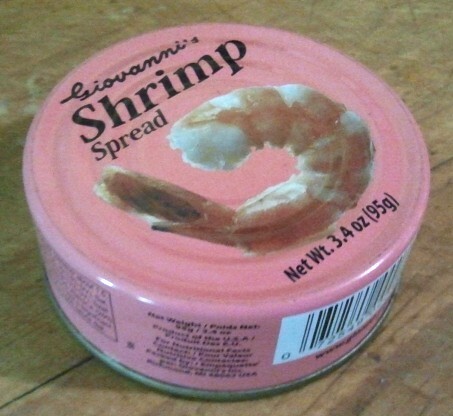 The place is loaded with surprises - like this stuff: Giovanni's Shrimp Spread. I'm a big fan of patés, potted meats, and confits both commercial and homemade, so I put this into my shopping cart without a second thought. The photo at left really doesn't do justice to the awesomeness of the spread's pumpkin-custard-orange color. 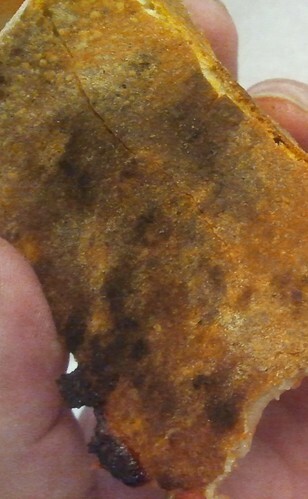 Despite having a very strong "dockside" aroma, it looked like the center of a pumpkin pie. The flavor was quite unique. 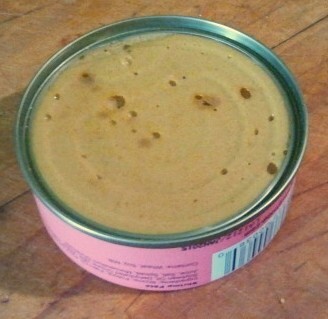 Shrimpy, yes, but with a faint livery taste like lobster tomalley (even though there is absolutely no lobster or liver in this paté.) Savory and not very salty, it paired well with the crackers we spread it on. Look for it at your local Dollar Tree. You can also check out Giovanni's Appetizing Foods on their Facebook page.